 Mouse anti Chicken CD45 antibody, clone UM16-6 recognizes chicken CD45, also known as leucocyte common antigen. CD45 is a heavily-glycosylated transmembrane protein tyrosine phosphatase (PTPase) expressed by all nucleated cells of haematopoietic origin. Variation in the expression of a particular CD45 isoform, is regulated during the haematopoietic development of the different cell lineages. CD45 is essential for antigen-induced signal transduction through the antigen receptor and as with other PTPase family members, acts in balance with protein tyrosine kinases, causing the dephosphorylation of negative regulatory tyrosine sites. Studies have indicated that dephosphorylation by CD45, is required for the activation of the src-family kinases p56lck and p59fyn. Investigations into the properties of CD45 in chicken models are limited, but there is evidence of the existence of an additional cysteine residue near the transmembrane region. The overall domain structure between mammalian and chicken CD45 appears to be conserved, but the sequence homology between the extracellular regions is very low. COS cells transfected with CD45 gene. Pavlova, S. et al. (2010) In vitro and in vivo characterization of glycoprotein C-deleted infectious laryngotracheitis virus. Wattrang, E. et al. (2015) CD107a as a marker of activation in chicken cytotoxic T cells. J Immunol Methods. 419: 35-47. Reddy SK et al. (2008) The BAFF-Interacting receptors of chickens. Dev Comp Immunol. 32 (9): 1076-87. Ulrich-Lynge SL et al. (2015) The consequence of low mannose-binding lectin plasma concentration in relation to susceptibility to Salmonella infantis in chickens. Vet Immunol Immunopathol. 163 (1-2): 23-32. Eren, U. et al. (2016) The several elements of intestinal innate immune system at the beginning of the life of broiler chicks. Microsc Res Tech. 79 (7): 604-14. J Anim Feed Sci 24: 134-43. Kjærup, R.B. et al. (2017) Comparison of growth performance and immune parameters of three commercial chicken lines used in organic production. Vet Immunol Immunopathol. 187: 69-79. Symons, A. et al. (1999) Domain organization of the extracellular region of CD45. Protein Eng. 12 (10): 885-92. Okumura, M. et al. (1996) Comparison of CD45 extracellular domain sequences from divergent vertebrate species suggests the conservation of three fibronectin type III domains. J Immunol. 157 (4): 1569-75. Jung, E.J. et al. (1997) Phosphorylation of chicken protein tyrosine phosphatase 1 by casein kinase II in vitro. Experimental and Molecular Medicine 29(4): 229-33.